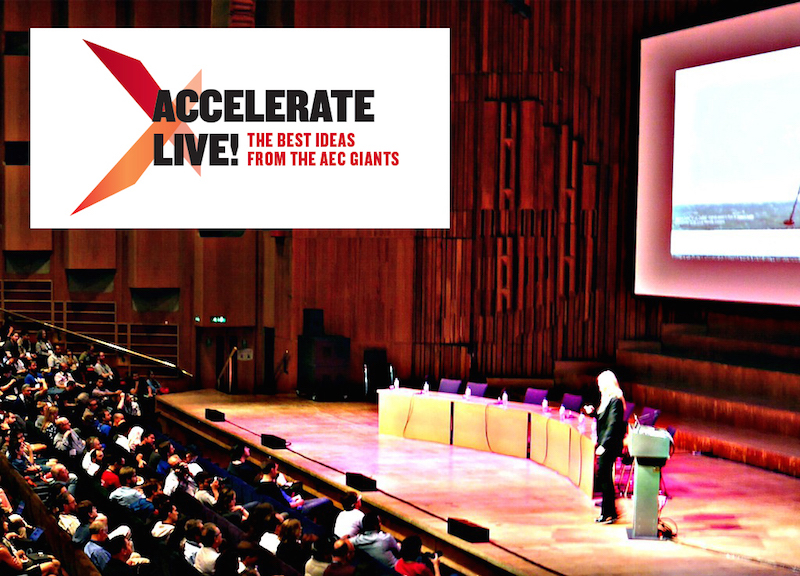 AEC firms explore how digital twin technology can bring more consistency to the design process and construction site. Those estimates from research firm Gartner—based on a 2017 survey of 202 organizations in the U.S., Germany, and Japan—confirm a trend that’s been building for several years. Research service Markets and Markets projects that the digital twin market will expand at a compound annual rate of 37.8% to $15.66 billion in 2023. According to Forrester, digital twins are already driving IoT platform adoption. And as the cost of IoT technologies and sensors has come down, so too has the cost of creating digital twins. What’s a digital twin, you ask? 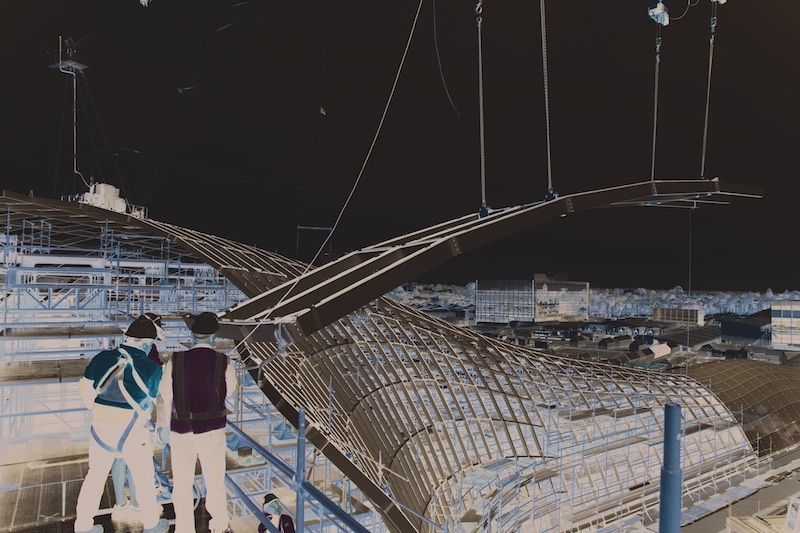 One of the first use cases for digital twin technology is related to gridshell construction in Germany. Façade construction specialist Seele Group is a partner in the consortium testing the technology. Courtesy Seele. Simply put, a digital twin is a virtual replica of a real object: a product, a structure, a facility, a system. The concept is predated by NASA’s “pairing technology” to operate, repair, and maintain spacecraft outside of the range of physical monitoring. Digital twin enables users to test how an object might perform under certain circumstances, and to predict outcomes—all without the need to actually be close to the object being twinned. So far, the manufacturing sector has been the primary adopter of digital twin. And the $10 trillion engineering and construction sector, “which remains severely underdigitized,” has shown greater interest of late in technological solutions that can incorporate artificial intelligence-powered algorithms, according to McKinsey. “Engineering and construction stakeholders can use neural networks, using drone-generated images and laser generated data capturing project progress, to teach an AI how to create 3D “twin models” to match BIM-generated models,” McKinsey wrote. 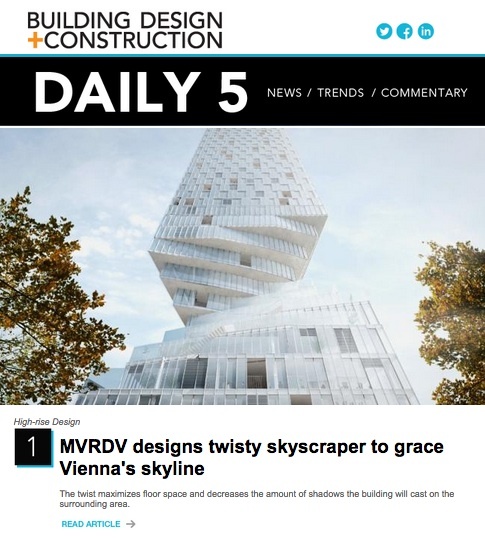 These applications could reduce decision-making cycles in a construction project “from a monthly basis to a daily basis”—through full automation of the project scheduling and budgeting using a combination of BIM, AI, drones, and laser scanning capabilities. Digital twin could be the remedy for an AEC industry where what gets designed sometimes only vaguely resembles what finally gets built. The digital twin can be used “for visualization, modeling, analysis, simulation, and further planning,” suggests software development firm Intellectsoft, which offers several digital twin applications for construction sites. There are questions that need to be answered before the AEC industry fully embraces digital twin. Right now, how information is layered onto any complexity, such as a model, is up the client. Consequently, there are “different levels of fidelity” between models and the finished product, explains Bella Nguyen, PhD, Senior Research Consultant with Arup, which next month will release a white paper on this topic. “How real is the digital twin? That’s what we’re trying to make sense of,” says Nguyen. In Germany, a consortium called DigitalTWIN, made up of several partners representing industry and research, is working on a project to develop digital tools and technologies that enable the integration and automation of services, processes, and workflows for the construction industry. Fabian Schmid, PhD—the consortium’s leader, and Head of Development of Digital Tools and Systems Integration for consortium partner se commerce GmbH, a division of the façade construction specialist Seele Group—notes that when his group started looking for partners three years ago, Seele’s designers were struggling to use the digital tools that the company’s R&D department had developed. “Pen and paper were often faster,” he recalls. So one of the consortium’s goals is to create more flexible systems. “What we’re looking to do is create a simple, out-of-the-box tool” that can be used in the field, says Schmid. Last June, the consortium initiated three use cases, two of which are directly relevant to the construction industry. Use Case 3 addresses effective and efficient installation using digital tools, as well as those tools’ flexible and safe use in harsh jobsite environments. AR technology in safety goggles would enable users to find their way around sites and provide information that otherwise would be documented and communicated solely by drawings. A grid-shell construction is being used to demonstrate a process chain from assembly planning and logistics to assembly support. Personnel will be able to see installation sequences in order to identify and locate correct parts and tools. The assembly is also compared with a digital model. A consortium in Germany is working on a research project involving three use cases for which digital twin is a tool. One of those use cases revolves around gridshell construction, and how the technology might speed up the positioning and installation of components. The research project is scheduled for completion in 2021. Schmid explains that one of Use Case 3’s objectives is to accelerate the positioning and installation of components. He notes that, typically, positioning and tolerances are based on paperwork backed by laser scanning that’s manually checked for accuracy. This process can take anywhere from six days to two weeks. If the use case works, engineers could check the positioning and tolerances in an afternoon using a powerful services infrastructure onsite and AR glasses, all supported by a cloud infrastructure that has the calculations. The consortium demonstrated this concept at Munich’s BAU show in January. Use Case 1 addresses availability and visualization of live measured data at the building through the digital twin, using edge-cloud and cluster computing technologies. To offer customers a facility management service that is optimized and target-oriented, the conditions of a building’s glass façade are continuously monitored, including temperature, humidity, air pressure, and the weather. A digital twin permits collaborative sharing of this measurement data by users, operators, product manufacturers, and consultants. 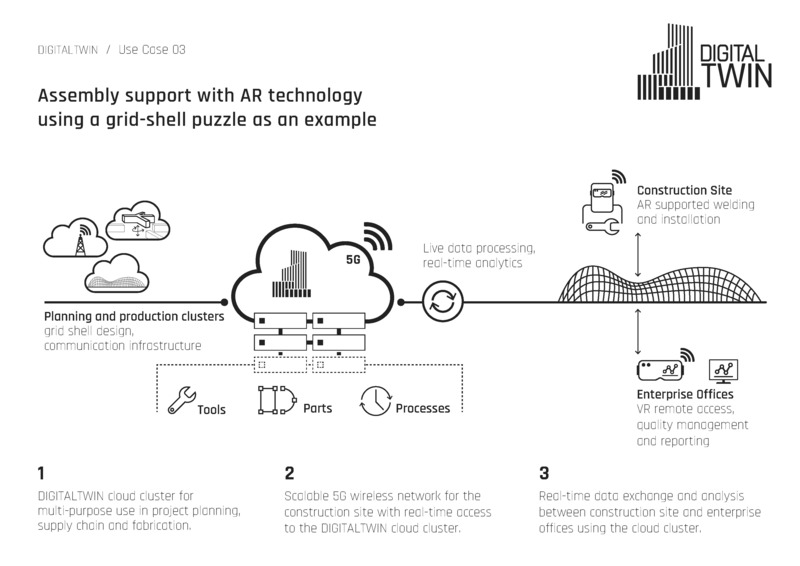 The use case allows the development of a fundamental platform that could range from hardware connectivity, rights management, data safety, and security; the integration of specific algorithmic analysis; and the implementation of AR technologies such as visualization using a 3D model or remote access for maintenance support.